This was one of the first “As Seen On TV” recipes I ever tried. I caught an episode of Made in Spain on PBS one evening (this is the cooking show by renowned Spanish chef Jose Andres), and this recipe just reeled me in. I’m not even a huge bell pepper fan. I mean, I’ll eat them, but I won’t go out of my way to find new and interesting things to do with them. But for whatever reason (maybe I was hungry or just simply entertained by Jose’s unbridled enthusiasm and quirky mannerisms), I wanted to try this recipe. I’m so glad, too, as it’s one of our favorite dinners now, especially during the colder months, and it’s a great recipe for company. While it’s meant to be served on its own as a stew — and a nice, crusty bread to mop up every last drop of the flavorful sauce– I also like to serve it over rice or pasta sometimes. Heat 2 tablespoons of the olive oil in a 12-quart pot (or a large Dutch oven) over medium-high heat until shimmering. Season the chicken pieces with salt and then, working in batches, brown them on all sides. Transfer the chicken to a platter and set aside. 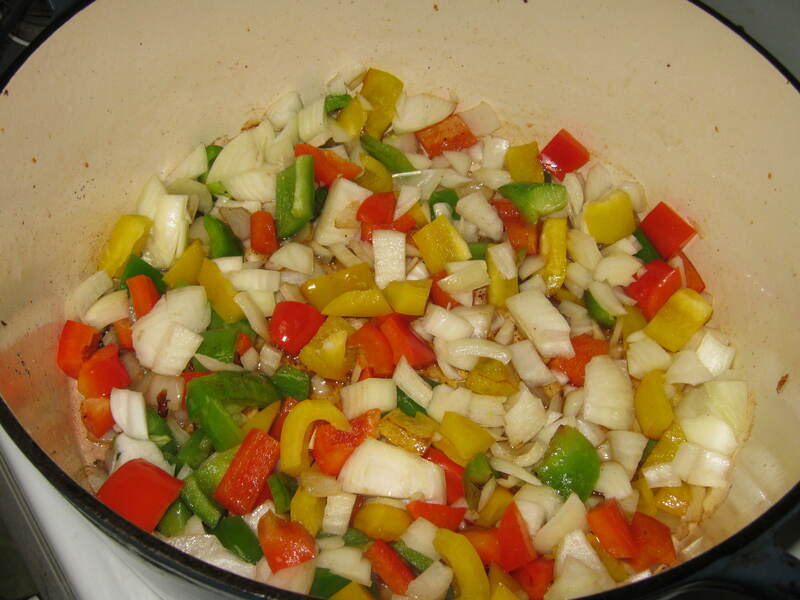 Add the remaining ¼ C of olive oil to the same pot, and when the oil is hot, add the onions and peppers. Reduce the heat to low and cook slowly until the vegetables are dark golden brown, about 30 minutes. Add 1 tablespoon of water if the onions start to burn. Add the garlic and cook for 5 more minutes. Then add the white wine and cook until it evaporates, 4 to 5 minutes. Add the jamón/prosciutto and the browned chicken pieces, as well as any juices that have collected, and cook for 5 more minutes. Stir in the pimentón, tomato sauce, rosemary, bay leaf and water; simmer over low heat for 1-2 hours or until the meat starts to fall off the bone. Season with salt and pepper, to taste, before serving. A lot of this recipe’s prep work can be done while other parts are cooking. Start by browning the chicken, in batches, on all sides (start with the skin side down). 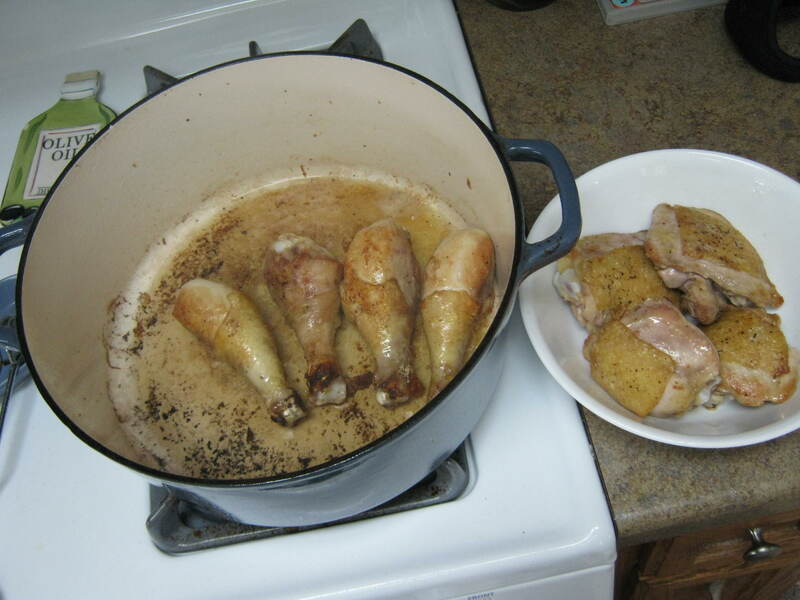 I did the thighs first, and then set those aside to do the drumsticks. Be really careful when turning the chicken pieces, because the oil is very hot and will splatter. Wear full protective gear or at least something with a long sleeve on the arm you use to turn the chicken. I’ve received self-inflicted oil splatter tattoos on my arm more than once. While the chicken is browning, dice the onions and peppers into roughly similar sized pieces. 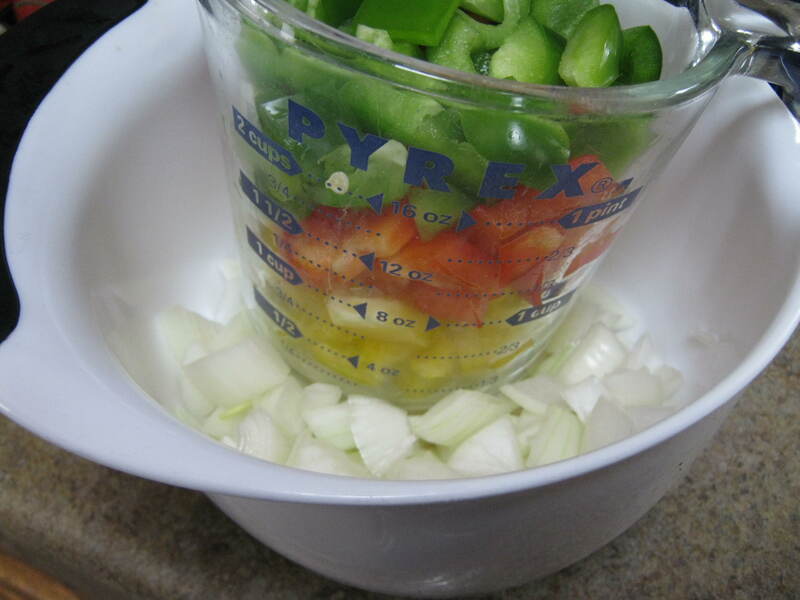 I don’t measure these ingredients terribly closely, but usually end up with about two cups each of onion and peppers. The original recipe calls for equal amounts of green and red peppers, but I like to use a combination of as many peppers as I can find (red, green, yellow, orange), and dice enough to get two cups’ worth. 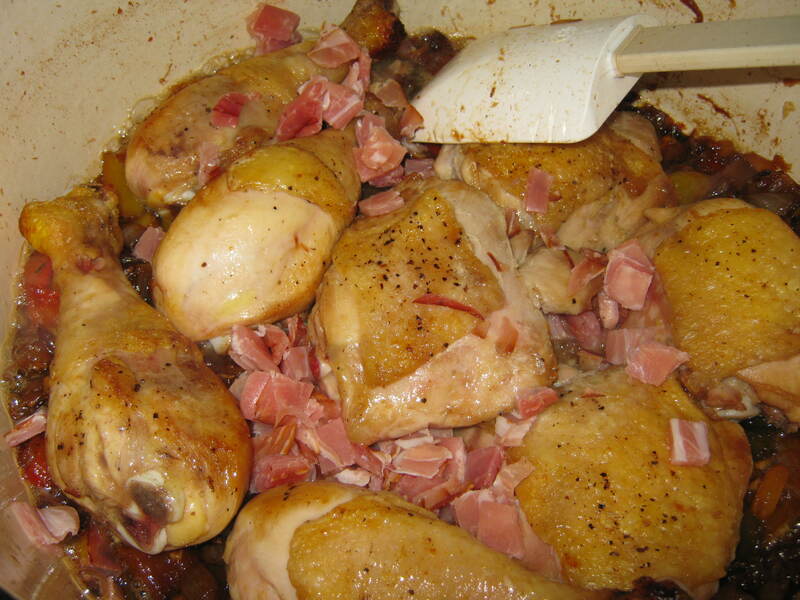 When the chicken is brown on all sides, remove it from the pan and add ¼ cup of olive oil to the same pot. 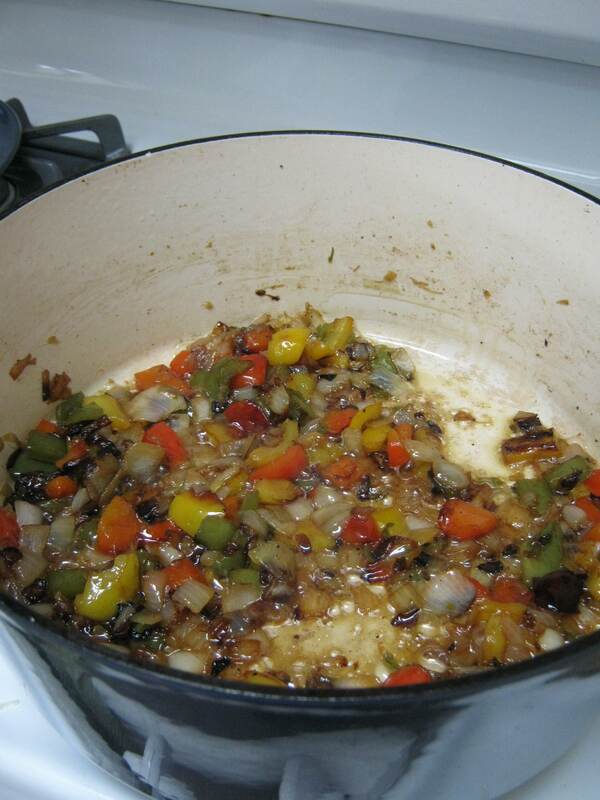 Once the oil is hot (it will not take long), add the onions and peppers. Look at that colorful medley! Give them a good stir to get them all mingling, and reduce the heat to low. Cook slowly, uncovered, until the vegetables are dark golden brown, about 30 minutes. Keep an eye on them and stir occasionally. They will start to get darker as they cook. If they remain rather brightly colored after 15-20 minutes, turn the heat up just a tiny bit. Add 1 tablespoon of water if the onions start to burn. While the onions and peppers are cooking, start prepping the other ingredients: mince the garlic, dice the jamón (or prosciutto), measure out the wine, water, pimentón, even open the can of tomato sauce if you’re feeling ambitious. After 30 minutes, the pepper mixture should look something like this. Add the garlic and cook for 5 more minutes. Then add the white wine and cook until it evaporates, another 4 to 5 minutes. When the wine has evaporated, add the jamón (or prosciutto) and browned chicken pieces, as well as any juices that have collected. Stir gently to acquaint the ingredients and to coat the chicken well. 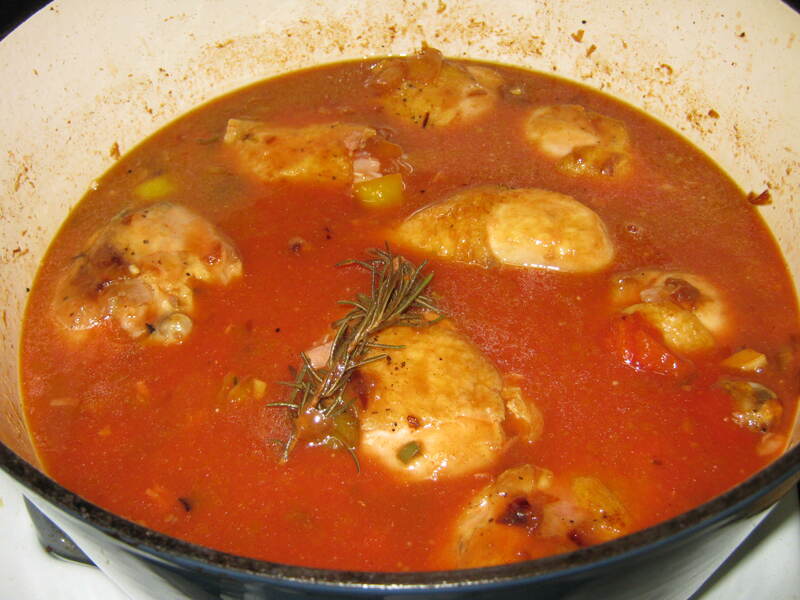 Cook for 5 more minutes, then stir in the tomato sauce, rosemary, bay leaf, pimentón, and water. Simmer over low heat for an hour or longer (even up to 3 hours) or until the meat starts to fall off the bone. Season with salt and pepper, to taste, before serving. This stew is fabulous served with nothing else but good, crusty bread. It’s also great served over rice or fresh pasta. Enjoy! Thank you for posting this recipe…I am cooking it now and can’t wait to tell you how good it will taste. I hope you loved it as much as I do! 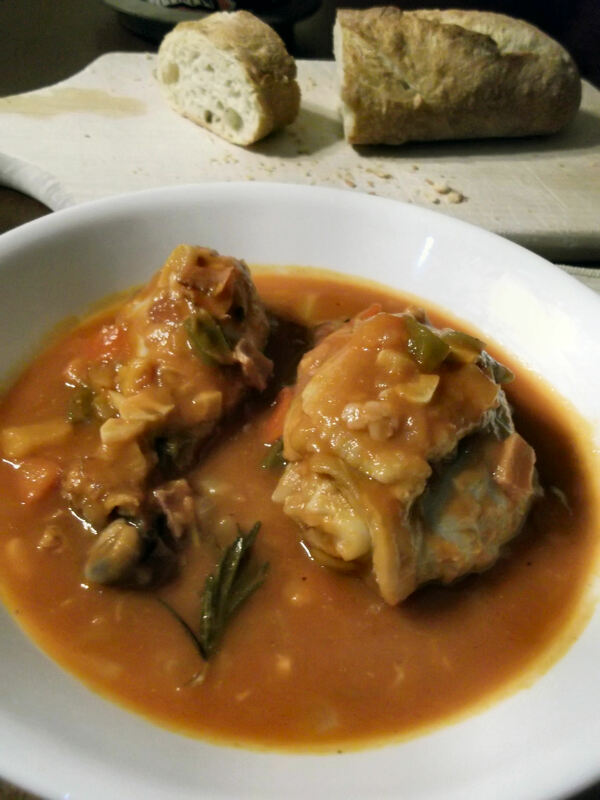 I tried it (Pollo Al Chilindrón (Spanish/Aragon Chicken Stew with Bell Peppers) and it was great ! First of all, your recipe is kind of perfectly description. Every Step very well described, with photos- wow, you never get lost ! We will defiantly eat it again soon ! Can this be cooked in a slow cooker through the day? Yes, you could make it that way, but either add the chicken much later in the process or only cook it a few hours. I cooked it all together in a slow cooker for several hours (4-6, maybe?) and the chicken literally fell off the bone, leaving random hard bits of bone etc. in the stew that made eating a challenge.